Church School during the school year is every Sunday of the month. Church School is at the beginning of the 10AM service. Free baby sitting is also offered. 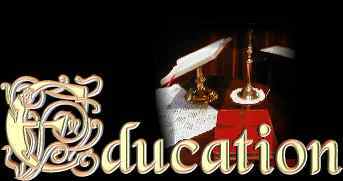 The success of the Church School program depends upon the faithful attendance of all students. St. Andrew's youth group is for teens in middle school or high school. We meet twice a month on Sunday evening. The group participates in Diocesan youth activities as well as our own outreach, inreach, learning and fun activities. Enrollments are currently being accepted. Spread the word to anyone of preschool age. If any of you are making jam, knitting, crocheting or creating ornaments, please make a few extra for the preschool. We raise money for scholarships. We could admit more children or extend the days, if we had more money. St. Andrew's Preschool began its first year in November 1982. The preschool is licensed for 25 childrenbut enrollment has been limited to 18 in order to provide the best quality education and environment for the children. The parish believes that the preschool years are a vital time in a child's growth and development, and seeks to provide a program that allows each child to develop at hisor her own pace. The school seeks to impart readiness skills to preparethe children for local public schools, while making the school environment a loving and secure place for the children, which will help them develop a positive self-image as well as Christian values, and social and intellectual skills. The school is governed by a school board which consists of the rector, a vestry member, a church member, two parents and the school director. The board meets quarterly and assists the director in making decisions on tuition, scholarships, emergency plans, etc. The director is responsible for developing curriculum, hiring employees, and maintaining financial stability. The board is the final decision making body for the school. The school is financed by the parents through tuition. Extras, such as improved curriculum materials, equipment, and scholarship funds, come from fund-raising events put on by the church or by the school. This site was designed courtesy of Crystal Cloud Graphics using digital camera images of the historic St. Andrew's Church in Ben Lomond, California and modified using XARA. This site is navigable for the seeing impaired. Contact web mistress KytheraAnn with comments or questions.